Oranges …….…….invoke sensations, flavours and a plethora of memories. As kids how we loved our favourite orange bar. It was the best treat for the parched throat during summers. Sucking the ever dripping ice lolly would leave our tongue and fingers coloured, but it was so much fun. Memories of eating sweet oranges during sunny winter afternoons in our lawn, squeezing the oily juice from the skin into each other’s eyes only to get it sprayed back into our eyes was game that would leave us rolling in laughter.. Memories of marmalade being made in the kitchen , flooding our home with the lovely citrusy aroma…..love for fresh orange juice………love for orange cream biscuits…..and now, the love for dark chocolate with candied peels……the list is endless. Last week, piles and piles of oranges in the market impelled me to bake something orangeee. How about a cake with real oranges? I added some whole wheat flour to the recipe. Drenched with orange syrup and coated with orange glaze, It was moist, the juiciest and the most flavourful cake I have ever baked. I have halved the ingredients from the original recipe. Half cup of all purpose flour has been substituted with whole wheat flour. Preheat the oven to 180 degrees C. Grease one 9x5 inch loaf pan. Line the bottom with parchment paper, grease and dust the pan. In a large bowl, beat butter and sugar till light and fluffy. Add eggs, one at a time, beat well after each addition. Add zest. In a bowl, whisk together all purpose flour, whole wheat flour, salt, baking powder and baking soda. In another bowl combine buttermilk, orange juice and vanilla essence. Add flour mix followed by buttermilk mixture to the batter (butter, sugar, egg and zest) alternately mixing well each time. Pour the batter into the prepared pan. Bake for 40 to 50 minutes or until a toothpick inserted in the center comes out clean. Let the cake cool in the pan for 10 minutes. Remove from the pan and cool in the rack. 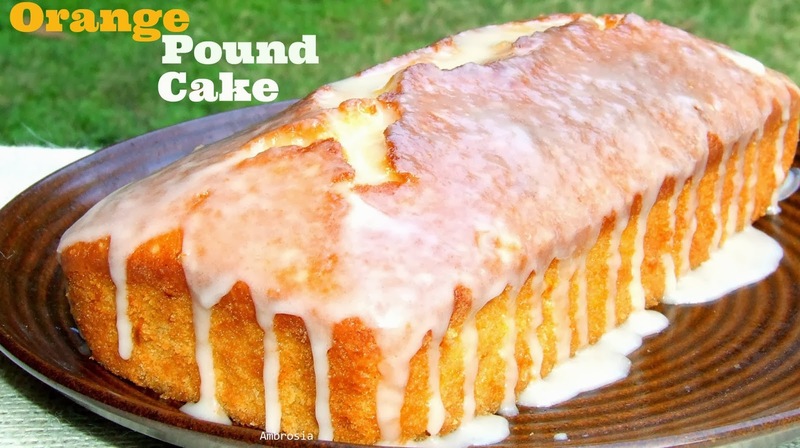 While the cake is cooling make orange syrup stir together orange juice and sugar in a pan over medium heat until the sugar dissolves completely. Cook for another 3 minutes. Poke holes in the top and sides of the cake with a tooth pick. 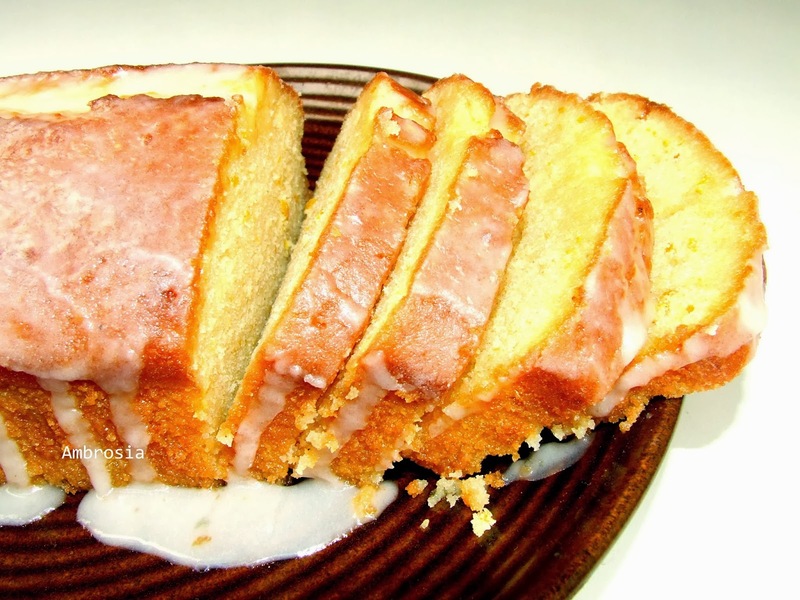 Pour warm syrup on top of the cake and brush the sides with syrup. Repeat. Let the cake cool completely. 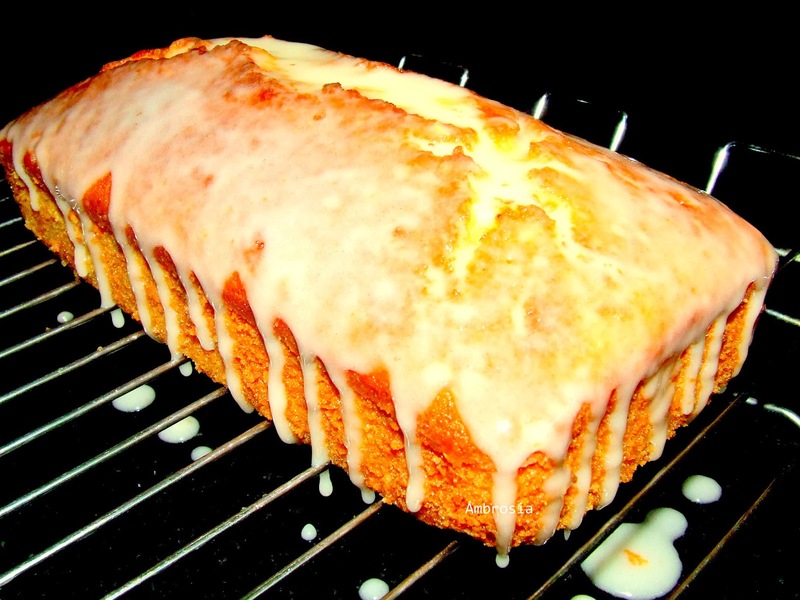 To make orange glaze, whisk together confectioner’s sugar and orange juice. The mixture should be thick but pourable. Add more juice if the mixture is stiff. Pour the glaze on the cake and let it drip down the sides. Let the glaze harden. Slice next day and enjoy!